I am delighted to announce the publication of Book 6, Catch of the Day; How Much Does It Weigh?, my latest book in the twelve-book BioFables, Series 1. Children younger than ten or so might find it helpful to go back to read the first two prequel BioFables books (Whoosh and E-I-E-I-Uh oh) after they’ve read the rest of series. 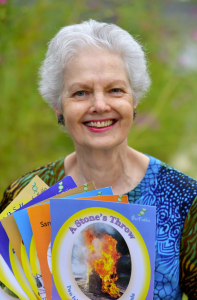 After a long career as an industrial management consultant at Technology Management Associates, Inc. (the firm I founded in 1973) and five years as a research chemist before that, I have embarked on a joyful journey of writing children’s stories. These stories just happen to include a decent amount of STEAM (Science, Technology, Engineering, Arts, Math) topics along with a scattering of Humanities and lessons intended to have some socially-redeeming value. The STEAM topics derive from my life-long interest in science, an undergraduate degree in Chemistry from Illinois Institute of Technology (IIT, now called Illinois Tech), and a host of domestic and international clients I have had the privilege to serve. The socially-redeeming parts of the stories have evolved from the continuum of memories from my childhood through this present time in 2018, and include the ethical principles instilled with my parochial school education, an MBA from Northwestern University and my 30+ years as a CMC (Certified Management Consultant). VoyageChicago published an interview about BioFables in November, 2017: Meet Joanne Gucwa of BioFables. IIT Magazine’s Spring 2017 Issue focuses on women in STEM fields; see the article Taking Science and Fiction to Extremes. Not having found a taxonomy of STEAM and social topics that seemed suitable for these BioFables books, the management consultant within insisted that I design diagrams and tables so parents, teachers, and perhaps older children, might find resources that point them to additional information for each chapter of each book. The diagrams are being developed into a Companion Book series to accompany each BioFables book. The Companion books and this site’s tables are a work in progress. Thanks for your patience as they are developed! Sand Sack's Companion Book is now available. Book 6: Catch of the Day, now available . "I look forward to your next book!" "It was a real pleasure...'meeting' Melody and Mallory!" "It's my favorite book (Book 3) in the series so far! I really enjoyed it." (Palisades Escapades) "I love that title! I am enjoying the book very much." "(Book 5) was especially interesting to me because I had no awareness of these islands." (Companion Books) "What a brilliant concept! I had no idea how rich and full of information the BioFables books are. Teachers will love them. Please get them published soon."